They are students of class X, but unlike other students of their age, these minors are now entrepreneurs. 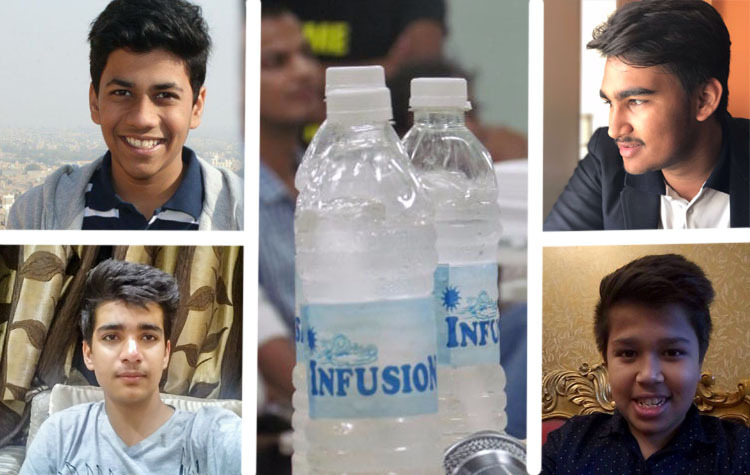 Meet Chetanya Golechha, Utsav Jain, Bhavya Badalia and Mragank Gurjar — the four young owners of a beverage company, Infusion Beverages. The company produces flavoured water without any preservatives. “Our drink is healthy as we do not use preservatives or sugar. It is completely natural and the ingredients used help in digestion and weight loss. It is also good for skin,” said Golechha. How did the idea click? “The idea stuck us while we were travelling. We realised that there is a huge market for health drinks,” said Golechha. “Our entrepreneur journey began with our participation at the entrepreneurship fest of our school in April last year. Although we were out of the competition in the first round itself, we learnt our lessons well,” recalls Badalia. The teenagers returned from the fest with an order of 150 flavoured water bottles. Since then, there has been no looking back. The youngsters then participated in various entrepreneurship competitions like those of IIT-Kanpur, IIM-Indore where they received wide appreciation. Their venture also won awards at The August Fest or Malviya National Institute of Technology (MNIT). The latter helped them in obtaining the patent for the product. Infusion Beverages has, so far, sold 8,000 bottles of flavoured water — kewra and rose flavours — through B2B mode. The company was recently in news for getting a funding of Rs 3 crore. “The investor is based in Indore and we will soon be setting our plant there. We will now focus on central India market,” explains Golechha. But what about their studies? How are they managing them? “We have divided our timings in such a way that there is no clash between our studies and business requirements,” the confident Golechha said, adding, “Over time, we have learnt three things are needed for success — determination, focus and patience.” The young lads, who want to pursue commerce in 11 and 12 classes, seem to have learnt the right mantra for the gruelling competition ahead.